For those of us who adore our pets, it’s impossible to imagine locking them inside tiny cages for months and depriving them of food. For Budi the baby orangutan, however, this was a heartbreaking reality he suffered through on a daily basis. The poor little guy didn’t know what living outside of a confined space or being well-fed was like. Severely neglected by his owner, he probably wouldn’t have survived past a few years. 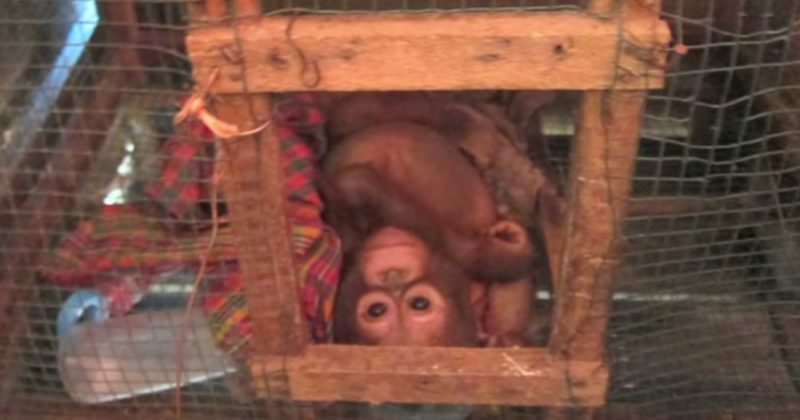 Thankfully, the woman told authorities in Ketapang, Indonesia, that she had a very sick ape she was willing to hand over and the caring people from International Animal Rescue (IAR) stepped in to care for him. For the first year of his life, Budi lived in a small chicken cage and was fed only condensed milk. He was found there in extremely critical condition in December 2014. When the team from IAR brought him back to their rescue center, he was so weak that he couldn’t move, let alone sit up. His body was swollen with fluid due to the lack of protein in his diet and being moved at all caused him to cry out in agony. It’s heartbreaking to see how much he’s suffering while being checked out by a vet, but it’s also amazing to watch him receive gentle care for the first time. Despite all this sweet baby has been through, he proved how tough he is throughout his recovery. Check out his inspiring progress below! Now over two years later, he has entered “forest school,” the next step in his journey toward being an independent orangutan who will be released back into the wild. We’re all rooting for you, Budi! If you’d like to “adopt” Budi by donating money for his care, click here, and be sure to share his amazing recovery with all the animal lovers in your life!